Have Lakers dropped the ball with coach appointment? The Los Angeles Lakers' management baffled their own fans when they decided to look past former coach Phil Jackson and instead hire Mike D’Antoni as the new team coach. After all, Jackson has won a record eleven titles as coach (five with the Lakers) while D’Antoni has reached the playoffs just five times in his 10 seasons as a head coach. The argument should be over here. Jackson wins over D’Antoni 11-0. Period. But for argument’s sake, let’s see what possibly would have led Jerry and son Jim Buss to go with the latter. D’Antoni is very familiar with Lakers' Steve Nash, who he coached in Phoenix for four years – with the point guard twice winning the league’s Most Valuable Player award in that time. The new coach also has ties with superstar Kobe Bryant, who grew up in Italy when his father played alongside D’Antoni in the country’s professional league. Bryant said he admired D’Antoni’s play when he was young and both were also part of Team USA in recent years. But what was probably most important to the Lakers' management is D’Antoni being known as a fast-paced, high octane offense coach. His teams run up and down the court, play unselfish basketball and put up a ton of points. That should be music to the ears of the team's fans considering the “Showtime” Lakers of the 1980’s won five titles playing exactly that style. However, there is still plenty of reason to worry. The Lakers feature plenty of superstars like Bryant, Nash and Dwight Howard who will be expected to execute D’Antoni’s offense. But Bryant, 34, and Nash, 38, are a few years removed from their prime. Howard, who turns 27 in December, is a rebounding machine, but isn’t a day-in day-out explosive scorer. 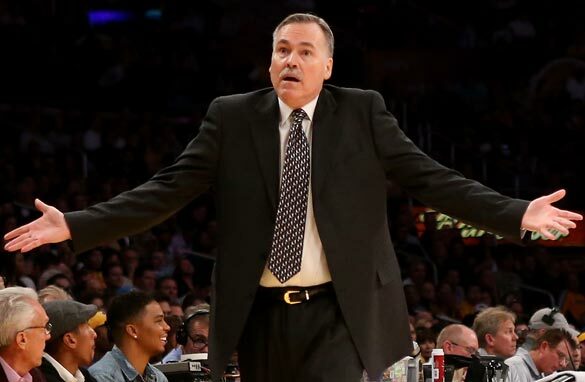 It’s hard to see this Lakers team scoring at the rate D’Antoni would like them to. Even if they do, they won’t defend at the level needed to win in the playoffs. D’Antoni’s previous teams in Phoenix and New York were often at or near the top of the league in offensive statistics, but in each of those seasons they were one of the worst defensive teams. The old saying is that defense wins championships. Maybe that’s why D’Antoni’s best teams never reached the NBA Finals. Maybe that’s why his teams lost more games than they won in the playoffs. A new era is about to begin in Los Angeles. While it is possible that the Lakers will be a more entertaining, high-scoring team under D’Antoni, they won’t be winning any titles any time soon. That’s because before D'Antoni was hired, the Lakers' management decided to pass up on a man who knows a thing or two about winning championships. Jackson might have been the better choice, but what will they do after he retires again after the season? After firing Brown, they need some longer term stability running the same system with the same core of players. They probably will not win a championship this year anyway with whoever the coach is. Next year, they might be able to contend and everyone will have 2 years together under D'Antoni's system going into next year's playoffs. I'm not suggesting D'Antoni was the correct choice, but Jackson likely wouldn't have done anything for this team, this year, either. Looks like the Lakers organization are having second thoughts. Maybe they should have went with Phil Jackson after all? I completely agree that Phil Jackson was the better choice, but you didn't even touch on the deciding factor they passed on Phil: Money. He was asking for the moon and beyond, because he could. The fact is he is deteriorating and actually wants to retire from the game and spend time with his family. The only way he was going to coach was if the lakers made it worth it. He was asking for benefits and special liberties in the contract that would hinder the team, such as a clause where he wouldn't have to travel with the team on occasion. Bottom line (quite literally) is it is much more complicated than "Phil Jackson vs Mike D'Antoni." Money, the contract, commitment, and several other factors made the decision. I'm surprised with the coach pick myself. He better win in the upcoming 2013-2014 season. LA is like NY the fans and businesses won't tolerate it as they did not with Mike Brown.